Russian President Vladimir Putin offered special counsel Robert Mueller two options for interrogating the 12 Russian intelligence officers charged last week with hacking the Democratic National Committee. During a joint press conference with President Donald Trump in Helsinki on July 16, the Russian leader pointed to an existing treaty with the United States that Mueller can use to request that Russian law enforcement interrogate the accused. The Russian investigators would then send the results of the questioning to the United States. Putin went beyond the treaty and offered a second option, which would allow Mueller’s team to travel to Russia and be present during the interrogation. The second option would require the United States to offer a similar opportunity to Russia, Putin said. Mueller is investigating allegations of Russian interference in the 2016 U.S. election, including allegations that members of the Trump campaign colluded with Moscow. Mueller has charged 25 Russian nationals, in two indictments, with election interference, but has produced no evidence or charges related to collusion. Moscow has always denied interfering with the election and Putin reaffirmed that position during the press conference with Trump in Finland. The Russian leader also offered to analyze any available evidence through a joint cybersecurity working group. “Once again, President Trump mentioned the issue of the so-called interference of Russia in the American election, and I had to reiterate things I said several times, including during our personal contacts, that the Russian state has never interfered and is not going to interfere into internal American affairs, including [its] election process,” Putin said. The existing treaty Putin referred to was proposed by President Bill Clinton in 1999 and adopted by the Senate in 2001. The “Treaty With Russia on Mutual Legal Assistance in Criminal Matters” lays out the groundwork and establishes a system for fielding requests for assistance in criminal cases by each country. Putin said that Russia has opened 100 to 150 criminal cases based on similar requests from other countries. As an example of a case that Russian law enforcement could pursue in the United States in exchange for allowing Mueller’s team into Russia, Putin described the case of Bill Browder. The Russian leader alleged that Browder’s associates wired $1.5 billion from Russia to the United States without paying taxes in either country. Browder’s adviser, tax accountant Sergei Magnitsky, was arrested in 2008 and died under questionable circumstances after nearly a year in police custody. Magnitsky had alleged, before his death, that Russian officials were engaged in massive theft from the state. In 2012, President Barack Obama sanctioned the Russian officials believed to be tied to Magnitsky’s death, drawing ire from Russia. At the press conference, Trump said that Mueller’s probe has had a negative impact on the relationship between the United States and Russia. The president noted that none of the charges were related to his campaign and suggested that Democrats are pushing the probe as the rationale for losing the election. “We ran a brilliant campaign and that’s why I’m president,” Trump said. Trump also doubled down on his criticism of disgraced FBI Deputy Assistant Director Peter Strzok, who led the probe into the Trump campaign before and after the election. Mueller removed Strzok from the special counsel team after viewing biased messages Strzok sent to his mistress, FBI attorney Lisa Page. In the messages, Strzok expressed his hatred of Trump and Trump supporters, his intention to “stop” Trump from winning the presidency, and an “insurance policy” in case Trump was elected. Strzok also mused about impeachment shortly after joining the Mueller team. Putin discussed Mueller’s previous indictment of 13 Russian nationals and several U.S. entities. That case has been delayed after the defense team requested extensive evidence related to the charges. Asked why Trump and the American people should trust him, Putin said that “you can trust no one” and that the two leaders instead worked on finding common interests and resolving differences on behalf of their nations. The Russian leader pointed to the fact that on the campaign trail, Trump expressed the need to restore the relationship with Russia. Putin said it was natural to be sympathetic to Trump’s candidacy as a result. The Russian leader also described the notion that Russia collected compromising material on Trump when he traveled to Moscow as “utter nonsense.” Putin said he had no idea Trump was in Russia at the time since Trump was only a businessman. The allegation that Russia has compromising material on Trump is one of the central claims in the so-called Steele dossier, a compilation of reports funded by the Clinton Campaign and the Democratic National Committee. The FBI used the dossier as the basis to obtain a warrant to spy on the Trump campaign. 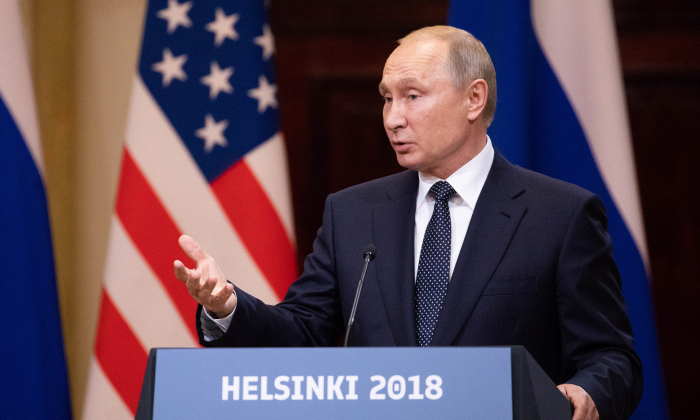 Correction: A previous version of this article in a caption stated the incorrect date for the joint press conference between President Donald Trump and Russian President Vladimir Putin in Helsinki. The press conference was held on July 16, 2018. The Epoch Times regrets the error. Chris Chappell gained a huge YouTube following with a channel dedicated to exposing the truth about China. His foray into American politics is already proving to be a success. His channel, “America Uncovered,” can be found here.